Just to prove that at 88, the Queen is still the ultimate royal trend setter, she has inspired a royal wave of photobombing. After THAT photo last week when the Queen lent in and stole the show as two Australian hockey players posed for a selfie at the Commonwealth Games, two of her grandsons have been following in her social media footsteps. And no surprises for guessing which one really got into the spirit of things. Here's Harry. William also had a go but his was a very sophisticated photobomb. A genteel smile over the shoulder of sporting knight of the realm, Sir Chris Hoy, completed the set of selfie stealing moments. As the Commonwealth Games really get into their swing in Glasgow, there's a large royal presence - and a lot of press interest. For in the last hour, the Duke and Duchess of Cambridge with Prince Harry have arrived at the games to watch some gymnastics and boxing. The royal trio took their seats in one arena while the Earl and Countess of Wessex popped into another to give a royal audience to as many sports as possible. But all of the royal visitors might struggle to get the attention that the Queen has had at the games. 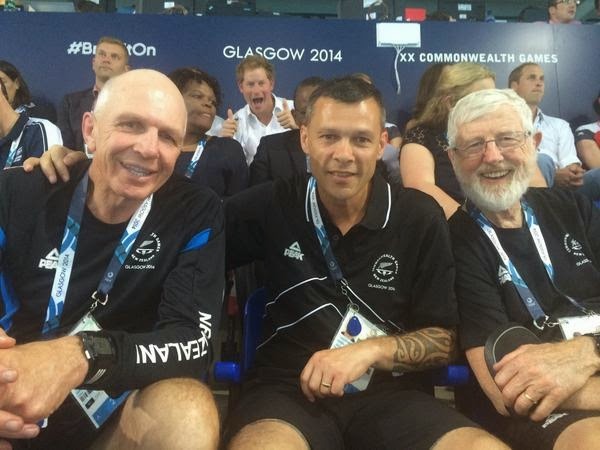 From watching and waiting for the baton to be opened on the day she declared the event under way to stunning the world by photobombing a selfie, these games have been all about Elizabeth II. Head of the Commonwealth and star of the games, the Queen is a tough act to follow. 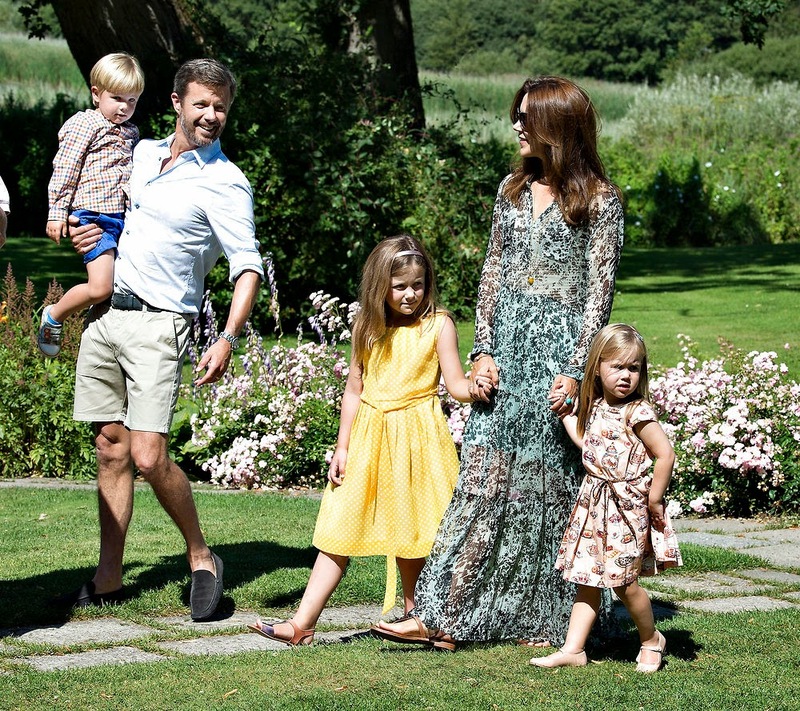 The Royal Family of Denmark have been enjoying their summer holidays and posed for photographs at Grasten Palace on July 24th 2014. Queen Margrethe II and Prince Henrik had arrived in Grasten on July 19th 2014 and on the following day, July 20th 2014, they received the Grasten Riders Association at the palace accompanied by the queen's sisters, Anne-Marie of Greece and Benedikte. Prince Felix of Denmark celebrated his twelfth birthday on July 22nd - the day was kept privately and there were no new official portraits. Belgium The King of the Belgians, Philippe, marked his first anniversary as monarch on July 21st 2014 - his country's national day. With so much attention on what royals wear these days, every week this section will feature the best outfits worn by leading royals in Europe in the week just gone. It probably all comes down to different tastes in the end but here are the top choices from the last seven days. Queen Mathilde of the Belgians wore several stunning outfits in the week as her country marked its national day and the first anniversary of the accession of King Philippe. But it was her choice of evening outfit on July 21st 2014 that really stood out. The queen wore a simple white dress with a striking print on the skirt featuring Flanders poppies - a reminder that in just a few days time, it will be a century since the start of World War One. Let the Games begin The Commonwealth Games got under way in Glasgow on July 23rd 2014 and the Queen starred in several images taken at the opening ceremony and posted on the British Monarchy and Clarence House Instgram accounts including a behind the scenes image. 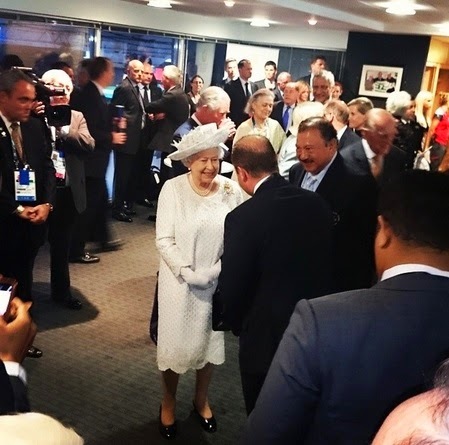 The British Monarchy tweeted several photos of the Queen and Prince Philip touring the Games on July 24th 2014. And the British Monarchy retweeted one of the most famous photos of the week - the Queen photobombing a selfie being taken by Jayde Taylor and Brooke Peris. Buckingham Palace released previously unseen footage of the Queen as a young princess to mark the opening of a new exhibition on royal childhood. The video was placed on the official You Tube channel of the British Monarchy. While all eyes are on what the queens of Europe are wearing at the moment, there seems to be a style trend growing among the heiresses of the continent as well. Because if you're in line for a throne and have a big day out to attend, chances are you'll be doing it in a pastel dress that co-ordinates perfectly with your sister's clothes. Pastel pink, pastel blue and ballet pumps are the order of the day for the queens in waiting of Europe right now - in fact, it's hard to find an heiress not making that fashion chouce. She is the fourth queen to visit Paris in less than six months and royal fashion watchers would have expected Letizia of Spain to storm to an outright style victory on her trip to the home of chic. But her outfit for her presentation visit to France has been slightly underwhelming and leaves Europe's newest queen trailing her counterparts in the royal fashion stakes. King Felipe VI and Queen Letizia arrived in the French capital at noon for their short presentation visit to the country and after an official welcome at the airport they were driven to the city centre for a meeting with the country's president, Francois Hollande. He's got used to welcoming royals to his very own palace in recent times with the monarchs of the Netherlands, Belgium and the United Kingdom already popping by in 2014. Prince George of Cambridge is now officially one. The little boy who will be king celebrates his landmark birthday on July 22nd 2014. And just like every little monarch in waiting, he now stars in new photos released to celebrate his special day. The prince and his parents are chasing butterflies and are caught, for posterity, staring into a future that is bright for all of them. A new poll taken this month shows an increase in the number of people in the UK feeling positive towards the royals since the birth of George. 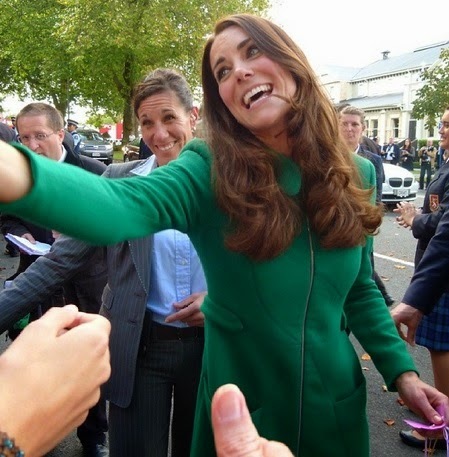 Kate is developing her own solo agenda even further and William is campaigning passionately for his causes, including wildlife issues, while balancing this with his royal role. Two of Europe's newest queens have shown a preference for a very new kind of headwear. For while in centuries past, Mathilde of the Belgians and Letizia of Spain would have had to stick to crowns and coronets, today the two royals have gone a bit more modern than that. And leading the way, as always, is fashion queen, Queen Letizia, who wore an Alice Band with stars for an engagement in Madrid. Meanwhile, Queen Mathilde was turning heads in a stunning hot orange feathered hat chosen for her country's national day and the anniversary of her husband's accession to the throne. Both women have their monarchy's royal jewellery collection at their disposal but have chosen to do things their way. And judging by the response, these consorts know how to pick the right option. Heads, they win. It's usually a big moment in a royal career and now we know when it will happen to the Duchess of Cambridge. Being sent abroad all by yourself to represent the Queen is a big deal and in September that duty falls to the duchess. Kate will go to Malta for two days to help in the celebrations marking the island's 50 years of independence. Kate will be there on September 20th and 21st and Prince George won't be going with her. Malta became independent from the United Kingdom in 1964 but the Queen remained head of state until 1974. The Queen last visited Malta in 2007 and while details of the duchess' itinerary haven't been released, the trip is bound to get global coverage marking, as it does, a milestone in her royal career.